2017-04-15 We spent Easter weekend with our son and his family over north of St. Paul, MN. All three of their daughters (2 in college an one in high school) were there so it was fun. John is the one that is organizing our three night backpacking trip in the Porcupine Mountains Wilderness State Park May 4-7 along with our other son, Charles who lives in our town here in Wisconsin. We have agreed to hammock camp on this trip so I took a hammock setup over with me to leave with John. I took my own setup too so we decided to check everything out Saturday night. Stealth campsite in the woods near our son's home in Minnesota. My setup was the ENO OneLink Hammock Shelter System plus the Snugpak Hammock Under Blanket, Ozark Trail 40F Climatech Mummy Sleeping Bag and my DIY top quilt/sleeping bag liner. The ENO OneLink system includes their tarp and Guardian Bug Net and ProFly Rain Tarp. Snugpak Jungle Hammock with integrated Mosquito net, Snugpak Hammock Under Blanket and Yukon Outfitters Walkabout rain tarp. John lives on a medium sized lake and just a short walk away is a wooded area that starts at the lake shore and goes back quite a ways. 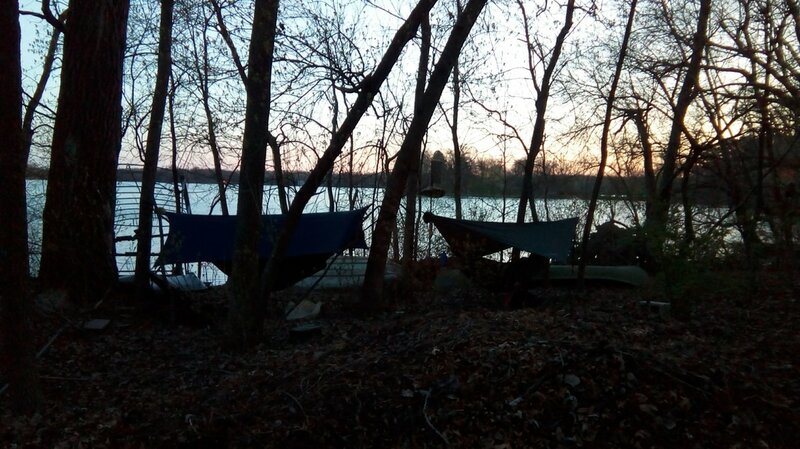 We found three trees that were the right space apart and close together and hung our hammocks there. We learned some important things about the gear and are glad we did this trial run. ENO OneLink Hammock Shelter System plus snugpak Hammock Under Blanket. John's setup included the Snugpak Jungle Hammock with integrated Mosquito net, Snugpak Hammock Under Blanket, a 30 degree sleeping bag and my DIY top quilt/sleeping bag liner. His tarp was a Yukon Outfitters Walkabout set up in a diamond configuration, the only way you can set it up with a hammock. We were both wearing lite long johns and wool socks. I had a lite down vest and an REI light down jacket. John wore a fleece vest over his shirt. We had sock hats as well. It was about 55 degrees when we started out and got down to about 45 by morning. We both started with just our sleeping bags as top quilts but added the DIY liner around 4:00AM. But we stayed warm and slept pretty well from about 10:30 until 6:15. Our overall conclusion was that the systems work. I found the Guardian Bug Net a bit of a problem with the Snugpak Under Blanket. I ended up putting the under blanket beneath the bug net as all the straps that the Underblanket needs to fit properly were just too cumbersome to run through the end openings of the bug net. When I got home I tried a Yukon Outfitters Kindle Under Quilt and that works very well. I'm still a bit concerned about temperatures down into the 30s. I think we'll take sleeping mats along just in case. 2017-04-01 A sure sign of Spring on my afternoon walk! 2017-04-01 One month until our planned Porcupine Mountains Wilderness State Park backpacking trip. Time to really get serious! But in the meantime I'm reading the second volume of H.M. Stanley's book, "Through the DARK Continent." It is his own account of his explorations of Central and West Africa in the 1870's. Kind of puts my hiking, camping and backpacking into perspective! The chapter I just finished last night covered their first couple of days in the Central African jungles. I visited that area a number of years ago and went on an hour or so "walk" into that jungle. That was way before my current interest in backpacking but as I think about the fact that by then Stanley had walked well over 800 miles with little or no idea of what lie ahead in terrain, threats from people and animals, weather or distance remaining, it is simply remarkable! And he did it all without freeze dried food, gas cannister stoves, ultra light weight gear, fancy tarps or hammocks or tents or sleeping bags? And no satellite gadget with an SOS button, nor any way anyone could have gotten to him in less than months anyway.... Why am I still "agonizing" over top quilts and under quilts and whether to buy Packit Gourmet, Goodto-go or Mountain House meals!? I don't know if this really applies to our planned hike, but I love Stanley's quote in chapter 5, having just decided to leave the last Arab trading post probably in what is now known as the Democratic Republic of Congo, and head into the completely unknown jungles, "A thousand things may transpire to prevent the accomplishment of our purpose : hunger, disease, and savage hostility may crush us; perhaps, after all, the difficulties may daunt us, but our hopes run high, and our purpose is lofty; then in the name of God let us set on, and as He pleases, so let Him rule our destinies!" I would recommend this two volume set (I am reading it on my Kindle app) to all backpackers. It is good to be humbled now and then as we enjoy hiking, camping and backpacking for pleasure.